There are 4 ferry routes operating between Japan and South Korea offering you combined total of 46 sailings per week. Panstar Cruise operates 1 route, Osaka to Busan which runs 3 times weekly. Camellia Line operates 1 route, Hakata (Fukuoka) to Busan which runs 7 times weekly. JR Kyushu Beetle Jet Ferry operates 2 routes, Hakata (Fukuoka) to Busan runs 3 times per day & Tsushima (Hitakatsu) to Busan about 14 times weekly. DBS Cruise Ferry operates 1 route, Sakaiminato to Donghae which runs 1 time weekly. As the frequency and duration of crossings on some routes varies we would advise that you do a live search for crossings from Japan to South Korea to get the most up to date information. 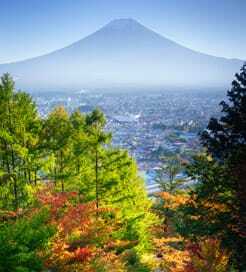 Japan is an island country in East Asia, divided into 47 prefectures and 8 regions in the Pacific Ocean. With over 6,000 islands in total, Japan is defined by many different landscapes ranging from cherry blossom-clad hills and iconic volcanoes to ultra-modern cities showcasing the latest technological advances. Tokyo, the capital, claims the most Michelin stars of any city in the world, so an exquisite sushi feast is never too far away. It also boasts a superb transportation system, an endless amount of bars and awe-inspiring structures, helping it become one of the most visited cities in Asia. Travelling by ferry is a useful way to get around Japan, as it offers a substantial amount of routes within its many islands and prefectures, which are all operated by a wide range of excellent ferry operators. You can also sail to numerous international destinations including South Korea, China and Russia.